Welcome to Monday, everyone's favorite day of the week, it's time for the wine of the week. A review with a little throw-back flavor to it. For a large segment of the budding wine enthusiast community, times are tough, and finding a bottle of wine with some soul can be a difficult task for under $15. I secured this wine from a local Costco a few years back, a bottle dwelling in virtual obscurity until it was brought to my attention the other day by a colleague, a young man named Eric. Oh, I don't work for Costco; in a previous position, I lowly wine brand ambassador of sorts with a side hustle, but it was not a wine I represented. This bottle was secured by the sweat of my own brow (okay, no sweat was actually involved) and no samples were uncorked in the process of writing this review. The other part of the reason, I wanted to bring this wine to your attention, is that it represents in this reviewers mind, what I like to call an, "an everyday luxury." By the way, if you're keeping score, and I know many of you are, this wine is from the famed Montalcino region, renown for producing some of the very best wines in the world. Not only regarding its superior aging ability but also its vast depth of complexity and excellent flavors, while reminding you of where it came from every step of the way. I gave this wine a mouth-watering 90 points. These particular clones of Sangiovese are unique to the Montalcino region; they've explicitly been developed to adapt the terroir of this unique region. One which tends to be warmer and arider, than you may find in the rest of Tuscany (specifically the Chianti Zone). In my opinion; Brunello's seem to have many similarities to Pinot Noir wines of Oregon, because of its smooth tannins (round mouthfeel) and ripe, rich earth and fruit-driven character. 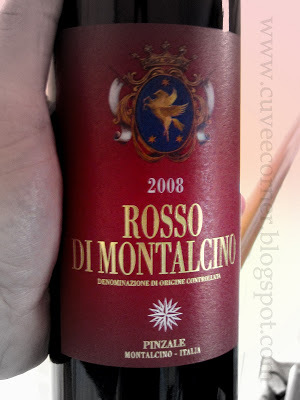 A flavor profile which is wonderfully expressed in many "Rosso" or young red wines from Montalcino. Young, generally meaning less time in the barrel, helping to keep the prices on the liberal side of the equation. A point of interest, a majority of these wines spend on average just six to twelve months in neutral barrels and six in bottle before release. The price of this wine came in just below $12, most of these styles of wine are in the $18 to $21 price range. So finding a wine of this caliber for this price makes the Pinzale Rosso di Montalcino a best-buy and a smart case purchase decision. Time for the tasting note: In the glass, you'll observe a light colored ruby core, the nose has real pop with dark rich plum, cherry, and fertile earth bathing your senses, like a trailer of the coming summer action movies. After finally giving the wine a go or as I like to call it the first splash down, bursting rich, ripe dark plums, ripe dark cherries, a taste of Tuscan country-side and generous rich round mouth-feel. Bright acidity holds it all together, like a canvas upon which lies a brilliant painting [insert favorite artist here], making this one fantastic wine, amenable to many natural food pairing situations. I like to say; "this is the kind of wine that does not get in the way of what you're eating, it instead complements it, making for a better dining experience." Honestly, folks, you're not going to find too many tastier 2008's than this one right here, if there is any left to be found. But finding wines of this quality then or now, and at this price, you better run, to fill your cart, before they're all gone. Until next time sip long and prosper cheers. Full Disclosure: I do NOT represent this wine in any capacity what so ever or Misa Imports.